Randal Edmund McManus was the son of Samuel and Jane McManus (nee Booth). He was born on 21st February 1893 in Dungannon. Randall enlisted in Dungannon. Randal E McManus was initially with the 6th Inniskilling Dragoons (Service Squadron) and the 2nd Regiment North Irish Horse, Service Numbers UD/88 (Inniskilling Dragoons) and 41505 (RIF). 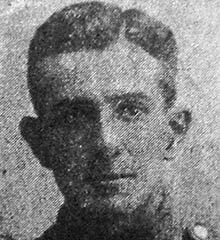 Lance Corporal Randal Edmund McManus then joined 9th (North Irish Horse) Battalion of the Royal Irish Fusiliers. Lance Corporal Randal Edmund McManus was killed in action on died at Kemmel Hill, Belgium on 19th April 1918, age 26.